Mike LOVES breakfast pizza so for Father's Day and his birthday this year, I made it for him! I figured I pretty much knew what breakfast pizza consisted of, so I decided I would just wing it and make up my own recipe. Let me tell you, it was delicious! I had never made it before and Mike raved about it. 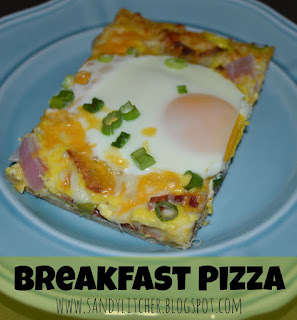 He said it was the best breakfast pizza he had ever had and that is big considering he has tried quite a few! Even though this isn't technically a fabulous Weight Watchers recipe because it isn't super low in points, it is delicious, so I had to share! Roll out pizza crust on cookie sheet. Crack 2 eggs and whisk until smooth. Take a pastry brush and brush the egg over the whole pizza crust and pour the remaining in the middle and spread towards the crust. Put a small amount of shredded cheese over the egg. Amounts to your liking, but this layer of cheese should be light, you can still see egg through the cheese. After the toppings are on, cover the pizza with your desired amount of cheese. Now crack the last 4 eggs one at a time into a small dish and drop onto the finished pizza. Bake for 15-20 minutes depending on what your crust calls for. Let cool for a few, cut, serve and enjoy! I also served this when I had a friend over for breakfast and it was perfect. Assemble it all before, pop it in the oven and when you are visiting you don't have to be cooking! Add a fruit salad on the side and it is the perfect special breakfast! Looking for some Weight Watchers recipes, you can find all my recipes here. Yum! We made regular pizza once and then cracked an egg on top to make it all gooey and delicious. What a great recipe! It is something different but something I think the whole family would love! Thank you for sharing this great breaky recipe! This looks delicious! My college serves a similar breakfast pizza and it's always my favorite! Can't wait to try your recipe (but with a dry egg!) this weekend. This sounds great and I love that you can really customize it with any topping you have around the house!! 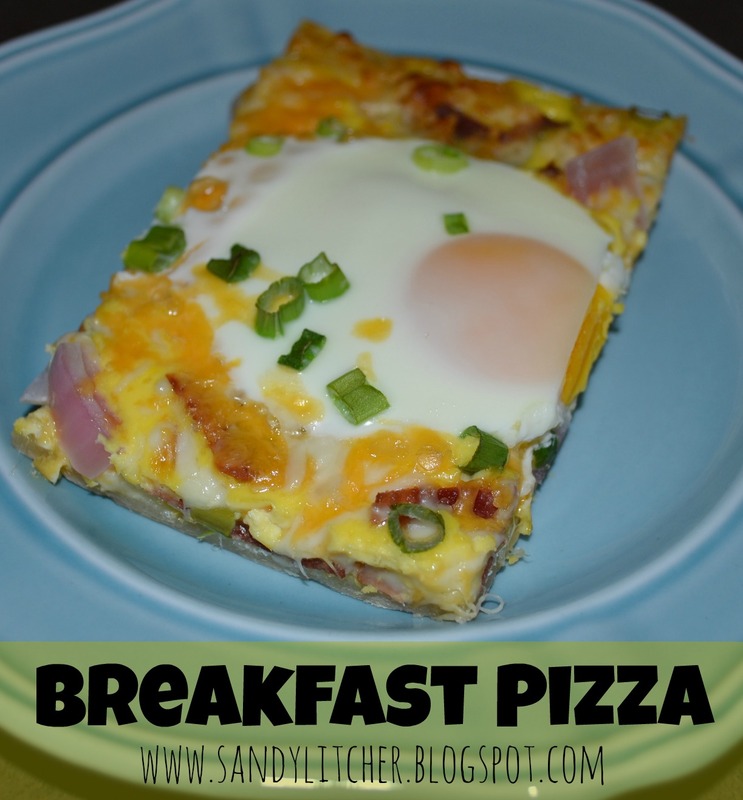 This is such an interesting idea - I've never heard of breakfast pizza! I am looking forward to giving this a try!